Yamaha has reduced the prices of its popular superbikes, the YZF-R1 and the MT-09 in India by Rs 2.57 lakh and Rs 1.33 lakh respectively owing to the Government's revised taxation policies. The 2018 YZF-R1 is now priced at Rs 18.16 lakh while the MT-09 gets a revised price tag of Rs 9.56 lakh (all price ex-showroom Delhi). The import duties on CBU (completely built units) motorcycles have been reduced from 75 percent to 50 percent, which has helped bikemakers revise the prices of their respective models. The updated YZF-R1 was launched last year in December with a revised wheelie control and an auto-blip downshift feature on its Quick Shift System. The Yamaha R1 houses an in-line 4-cylinder 998cc engine that generates a max power of 200PS at 13,500rpm and a peak torque of 112.4Nm at 11,500rpm, mated to a 6-speed transmission system. Electronic wizardry includes features like launch control, traction control, slide control and unified braking system. There are 43mm KYB forks at the front while at the rear, it has a linked-type KYB monoshock damper- both of them being fully adjustable. For braking, the R1 gets dual 320mm discs at the front and a 220mm disc at the rear. The 2018 MT-09, on the other hand, gets a lot of changes. The design, for instance, is sharper and inspired by the MT-10. Even the fully adjustable front fork is new. It draws power from an 847cc in-line triple-cylinder engine that produces 115PS of max power at 10,000rpm and 87.5Nm of peak torque at 8,500rpm. Electronics include three ride modes and multi-level traction control. 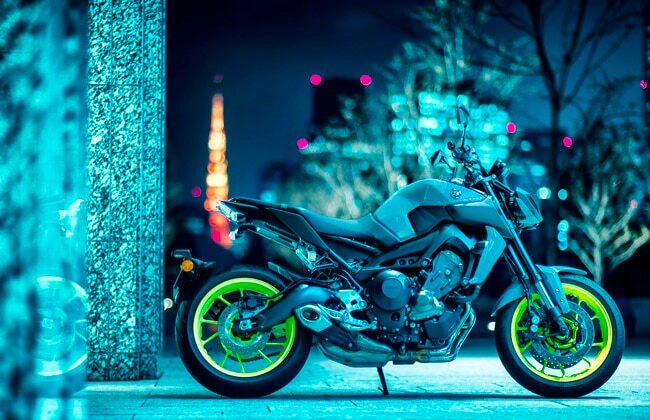 The MT-09 gets fully adjustable 41mm KYB front forks and an adjustable rear monoshock. For braking, it gets twin 298mm discs at the front and a 245mm at the rear with ABS offered as standard. Competing against the R1 are players like the Kawasaki ZX-10R, Honda CBR 1000RR Fireblade, Suzuki GSX-R1000 and the Ducati Panigale V4. The MT-09, on the other hand, faces competition from the Ducati 797, Kawasaki Z900, Triumph Street Triple S and the yet to be launched Suzuki GSX-750S. Apart from Yamaha, Suzuki also slashed the prices of Hayabusa & GSX R1000R recently.